Bringing the humble dimmer switch into the 21st century for a huge range of applications including architectural, retail, leisure and entertainment. The simple glass touch interface is backed by world leading lighting control software allowing creative programming for all types of applications. With 8 built-in scenes and up to 36 dynamic or static scenes, the SU allows the user to precisely control dramatic scenes. 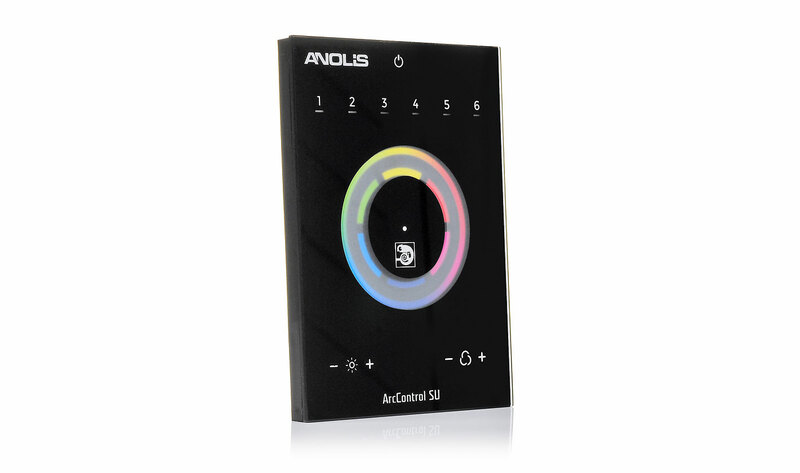 Programable via PC/Mac and connected directly via micro USB the ArcControl™ SU allows the user complete flexibility. The sleek glass touch interface is both aesthetically pleasing as well as intuitive and easy to use. Using DMX, the ArcControl™ SU is ready to connect to all Anolis systems, keeping the user in complete control.